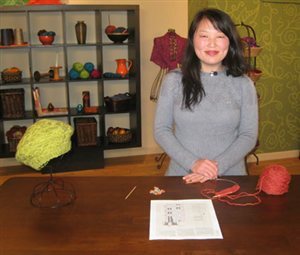 Celebrate shapes and shaping on this episode of Knitting Daily TV with editor of Interweave Knits magazine Eunny Jang and expert Clara Parkes. On the final episode of this season of Knitting Daily TV Eunny demonstrates the infinite or endless loop cable, as seen on the Arabesque Beret design shown here from the special issue Interweave Knits Accessories 2011. Eunny is wearing the Abbey Pullover from Knitscene Fall 2011. 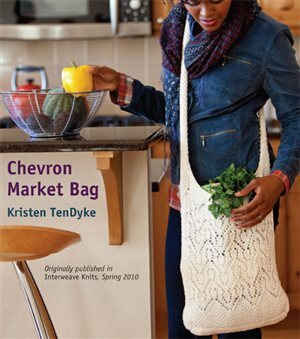 Eunny joins designer and author Kristen TenDyke with a fun market bag that celebrates the chevron. Kristen demonstrates the seed stitched edging on this bag, which gives it some added strength in the shoulder straps and bottom. 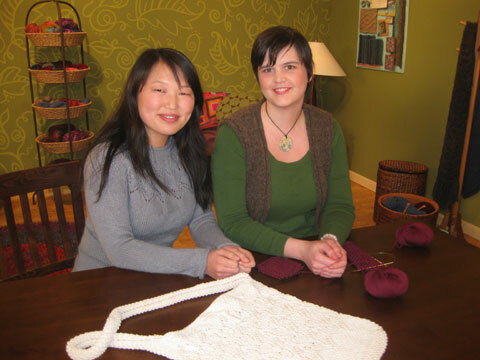 Download the free pattern for the Chevron Market Bag and knit along with Eunny and Kristen. Clara Parkes and Eunny are back in the Knitting Lab for the last time on this season, wrapping up the Yarn Spotlights with an in-depth look at multi-plied yarns, their characteristics, the benefits of multiple plies to a yarn, and their best uses. Featured on this episode is Valley Fibers' Northfield yarn, a merino, baby alpaca, and silk blended yarn that is comprised of various plies. You can purchase this yarn online at WEBs. Also seen is Knit One Crochet Too's Pediwick and Baby Boo yarns. Sponsored by WEBs, America's Yarn Store. 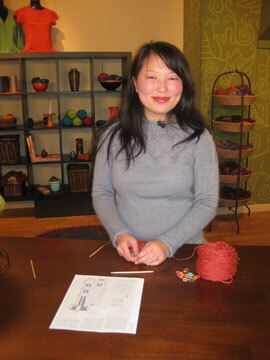 Eunny wraps up the entire season of Knitting Daily TV Series 900 with one more quick tip for "no stitch" boxes, and what to do when you see those empty boxes seen on knitting charts. Thank you for a great season! We appreciate our sponsors and viewers, and hope to see you again on another fiber-filled season of Knitting Daily TV in January 2013.